After despicable statements by AAP Rajya Sabha nominee Sanjay Singh, where he shrugged off the responsibilities of death of over 100 homeless people in the bitter cold fn Delhi, AAP MLA Saurabh Bhardwaj has taken the baton further by blaming ‘intoxication’ for the death of the homeless. It takes a tremendous amount of insensitivity to say something like this when death is staring in the face of their inefficiency. Defending Arvind Kejriwal led Delhi government, Bhardwaj said that this year, the Delhi government has faired better than previous year in terms of providing shelter to homeless. 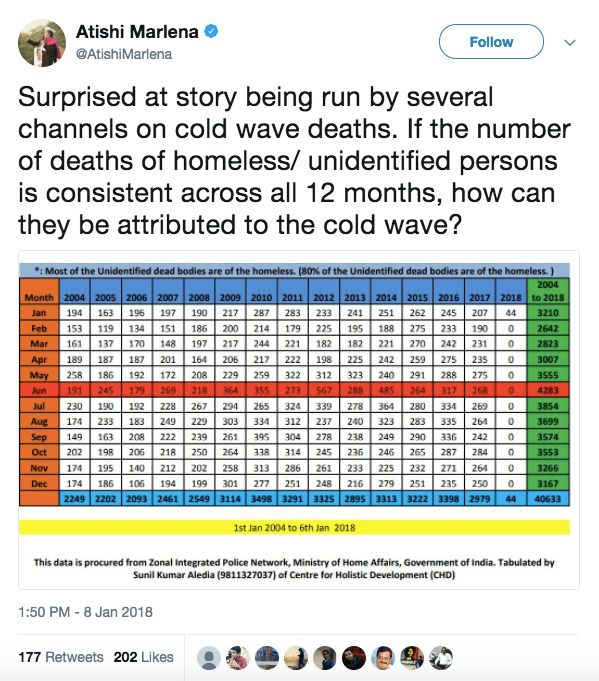 He said to associate the deaths in Delhi to cold would be wrong since maximum deaths of the homeless is reported in the month of June and July. AAP leader Atishi Marlena who is also adviser to deputy chief minister Manish Sisodia also had similar views. Bhardwaj further said that these deaths have occurred not due to cold or hot weather, but due to ‘intoxication’. He demanded a postmortem of such deaths should be undertaken, cost of which would be borne by the Delhi government. As per the report in Aaj Tak, Bhardwaj said that if the deaths took place due to overdose, investigation should be done on where such drugs are procured from. This outrageous statement comes days after Delhi Chief Minister Arvind Kejriwal blamed the LG for appointing a ‘useless’ officer as CEO of DUSIB (Delhi Urban Shelter Improvement Board) while conveniently forgetting as chief minister, he is the chairperson of the said Board.